Before we makeover this bar chart, let’s examine it. It’s pretty straight forward to compare the years within a single company, but the emphasis is on time, which means a line chart should be the natural first choice. But wait. The years are in reverse chronological order, so turn your head 90 degrees to the left and look at the chart. Without referring to the legend, one would likely assume that the most recent year was at the bottom of each set of bars. The bars are colored by year, which makes the comparisons across companies for a given year possible, but not easy. It’s easier to compare the years if they’re grouped together. Each bar uses gradient coloring and shadowing. Why? What value does this add? They’re using red and green bars together. They’re not thinking about the color-blind folks out there. They should be using natural, color-blind friendly colors. To address these issues, I’ve created the following viz using Tableau. Download a free trial here. The trend for each company. It’s much easier to see the large increase in Samsung’s budget, while all of the others in the view are relatively flat. 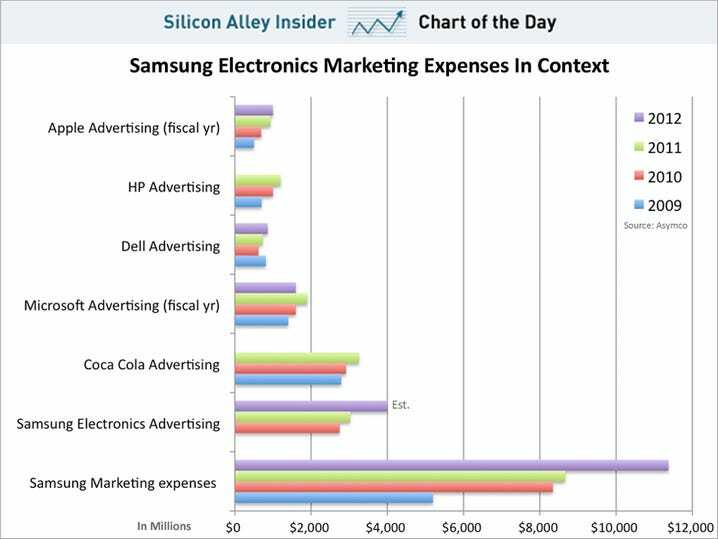 I thought it was important to emphasize the difference between Samsung and the other companies, thus the five small line charts, which all clearly show how much more Samsung is spending. How would you do this differently? Download the data here and the workbook here. Nice. I did a makeover on your makeover! That was fast! The only problem with adding Company to the column shelf is you distort the aspect ratio, which you want to try to keep as consistent as possible across the charts. I tried with a stacked bar for eac year, putting an invisible bar for the year total on the secondary axis, and leaving no gap between bars on either axis. It pretended to be a kind of Marimekko, but using the standard charts provided on Excel 2010. The goal is to tell both the total per year and its composition, and the variation per company per year. So I am not a Jedi but was trying to do something cool with parameters as they were one of my big takeaways from TCCEU13. Trying to use a parameter to select a company and it will spit out how many times more the Samsung spend was for the total period. Once I get that working I was considering adding a Year selector also. The area under the legend seems like a nice place to add a nice big number to show this result and it quantifies the info we see visually. I get as far getting the basic parameter to isolate expense by company but can't seem to find the hook that lets me ref Samsung's value in a calc that returns the correct value. I even tried cheating and hardcoding in the Samsung total but still did not quite work. You'll find this quite useful in lots of workbooks. You could then create another one for Coca-Cola and then you could create a calc that compares the two. There are lots of places you could take this simple calc. Hi Andy! Nice overview of the shortcomings of the initial visual. I like your remake. I'm not a Tableau user (still awaiting the promised Mac version...), so not sure whether this is possible in Tableau, but your main visual would be even easier to read if you labeled the data with the series names directly (just left of the first data point, e.g. "Samsung" in dark orange just to the left of the dark orange line) and removed the legend and y-axis. Great tip Cole...thanks! Yes, this is possible with Tableau. When I tried it though, the labels became way to close to each other and basically unreadable. As for the Mac version of Tableau, they announced at #tcceu13 that it would be coming out in 2014. Did you see the articles where this data came from: http://www.asymco.com/2012/11/29/the-cost-of-selling-galaxies/ and http://www.asymco.com/2013/04/02/the-cost-of-selling-galaxies-updated/ ? - are the others really flat? - how is it meaningful to look at the difference between one company's Advertising and other's Marketing? 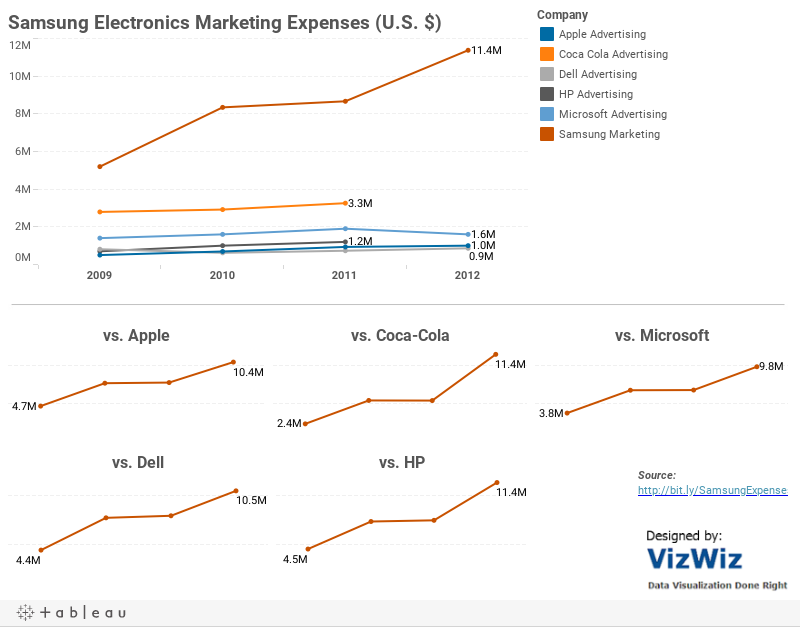 - Why do you expect Dell and Coca-Cola to spend zero dollars on Advertising in 2012? With reference to Andy's claim (1), and Joe's opening question "- are the others really flat? ", there's a very clear answer. Joe's other points reflect questionable methodology employed by Asymco in compiling the data, and that "flat" is a *dangerous conclusion* when dealing with data of a drastically different scale. I'm in favour of Andy's original visualisation to display the huge difference in spend between the companies (although be careful on scale - these should be $bn not $m as the visuals suggest)... but a relative (not absolute) index is necessary to compare growth.